Last night I saw a magnificent production of Tosca by the Australian Opera. If you had asked me in a text message what I thought of it, I would probably have responded with “great” and I might have added a thumbs up emoji. what you would not have seen was the way my hand punctuated the air as I wrote “great”, you would not have heard the awe in my tone, the gasp that preceded my word and nor would have seen the look of admiration and delight that flooded my face as I recalled the evening. Research suggests that when we are communicating attitudes or emotions, approximately 7% is communicated by the words and 93% by the nonverbal aspects of communication – facial expression, tone of voice, gestures and the like. In my text response to your question about the opera, you missed 93% of the message. It seems our youngsters are giving up on telephone conversations. They much prefer to text. They have lightning thumbs, and the messages fly back and forth at an amazing speed. These text conversations can be short or sometimes very, very long. And the longer the conversation, the more likely it is that misunderstandings, misinterpretations and false impressions will be built and expanded upon. Why? Because every time a message is sent, 93% of it is missing! Imagine trying to read a novel or a letter with 93% of the letters missing. In an attempt to overcome this paucity of information we insert emojis and giphs. They help a little, but not much. You send me a text letting me know you passed a very hard exam, one you had worried yourself sick about. I send back a message that says “Well done” and includes a thumbs up emoji and a heart. But if you were here with me you would have seen the expression on my face that showed I understood your relief, one that expressed the pride I felt. And you would have known the confidence I felt in you as I gave you a bear hug of appreciation. Instead? Just a couple of words and two small symbols. It’s a frequently used exercise in drama classes to say the word “yes” in as many ways as possible, implying as many different meanings as possible. The range is amazing. But in an SMS there is only the word. You work out the meaning for yourself, and with no nonverbal cues to help you, there is every chance you will get it wrong. Make sure you understand the weaknesses that exist in text conversations. Save the text chat for the factual, the trivial, for what it was designed – short messages and chat. These messaging services are named as they are for good reason. If you want to talk about something that involves the exchange of attitudes and the expression of feelings, subjects that have some depth and nuance, pick up the telephone or better still, meet for coffee. Most importantly, make sure your children and your students understand the dangers of “Chat” and the “Short Message Service”. They will avoid so many hurt feelings, misinterpretations the misunderstandings. If the conversation is worth having, it deserves 100% of the communication process, not just 7%. I think I would understand if the kids were teenagers. Changing adolescent behaviour is for the bold and the brave. But it should never have got to this. They weren’t always teenagers. They were once small children, open to our suggestions, amenable to our standards. Small children are waiting to be shown and told what is right, what is acceptable and how to behave. That’s why we need to be aware of the impact digital technologies and devices can have on our lives. That’s when parents must learn and understand about these technologies, so that they can set behavioural expectations. I learned when I was a child that I could not read at the dinner table, that the television would be turned off at meal times, that I could not just leave the table when I felt like it if Aunty Dot was visiting. My parents insisted that I say hello to visitors and politely answer questions before going off to play. I knew I couldn’t go into someone else’s house and just turn on the TV. I learned all this and more because my parents taught me. I became civilised. I knew how to behave. If we don’t teach our children “netiquette” where will they learn it? If children sit at the table texting instead of interacting with people, don’t blame the technology. Blame the lack of behavioural expectations. Look back in time to when the child was five, six or seven and Mum and Dad failed to take the phone or the tablet away at appropriate times, when rules were never made about devices at bed time. That’s why the teenager sits in the room glued to a small screen, or won’t get up in the morning. Grown ups must wake up! We have been caught out by the speed of the arrival of these devices. But we have no excuses any more. We can see around us what happens when we give our children a free reign to access technology whenever they feel like. It’s like giving them a lolly shop with no rules. Don’t be surprised if all they want to eat is candy bars, and don’t be surprised if they spend all their free time on their devices. Oh yes. I do understand. The kids are sitting around in the playground texting to each other instead of talking. The sports equipment is still sitting in the tub in the corner of the classroom because the kids aren’t playing at recess, they are on their phones. A stroll around the classroom during work time invariably reveals at least one kid taking a sneaky look at social media under the table. Ban them at school! It’s a quick and easy solution. And it will work – while they are at school. But once they leave school and have their devices in their pockets again, what will they have learned? It’s similar to achieving good behaviour in school by instilling fear of the strap. The strap didn’t teach kids about fairness, justice, honesty, respect, concentration or focus. It just taught kids to behave while the strap was around. If the reason for a child’s correct behaviour is fear of the back of dad’s hand, he’ll wait until dad’s not around and then do as he chooses. We know this. That’s why we banned corporal punishment in schools. Because it doesn’t work. We need to teach our kids how to control their own behaviour, themselves, regardless of straps, wooden spoons and the backs of dads’ hands. We need to teach our kids how to control their devices rather than letting their devices control them. Simply removing them from their grasp for a few hours each day doesn’t teach them anything about how to thrive in a digital world. We should be embracing the digital. Our kids need to learn when to use these devices appropriately and how to use them effectively. They won’t learn those things of we simply take them away from them. You don’t teach a kid how to be safe on the road by not letting him drive. Mobile phones and tablets can be powerful assets in the classroom, but both teachers and students need to learn how to use them. 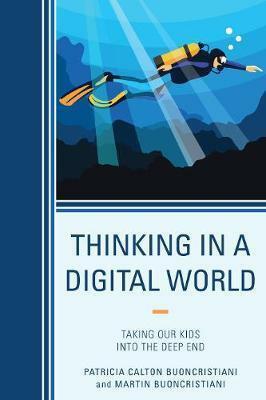 We provide powerful insights into the influence the digital world is having on how our kids think and how they learn in our book ‘Thinking In A Digital World”. We then describe practical strategies to help parents and teachers integrate these technologies into living and learning in ways that promote learning and thinking both within and outside the classroom. Our first attempts at written communication were with burnt sticks on cave walls. We told each other about the big game we had hunted. In Egypt we got much cleverer and developed a complex set of hieroglyphs to perpetuate our thoughts and experiences for others to read at a later time. The Chinese were cleverly beavering away developing pictographs – little images that represented objects, and ideograms – more little pictures, this time representing concepts. All of these are logographs – little pictures that represent the ideas and things we want to communicate to others. Perhaps the biggest problem with logograms is that they tell us nothing about how to pronounce them. It was around 1500BC when the Phoenicians decided to take a different route and develop an alphabet – a system of writing where the symbols each represented the sounds of the spoken language. That’s how we write today. We string sounds together to make words, and words together to make sentences. This was a profound change because it changed our brains and how we think. The use of the alphabet is strictly linear – one letter after another in a straight line. We can point to the beginning of a word or a sentence and know with absolute certainty that the end of the word or sentence will be at the end of the line of letters. This linear system influenced everything. It imposed a particular kind of order on our experience of the world. Enter the digital world. We learn that time isn’t necessarily a straight line at all – there is something called a time-space continuum and space certainly doesn’t exist in straight lines. Jazz is full of riffs and recursive elements. Intuition is becoming respectable again. When we read on the internet we switch and shift constantly, jumping from one hyperlink to another. Perhaps we become so enmeshed in the world wide web that we never get back to where we started at all. Movies and television stories constantly move back and forth in time and often end with frustrating question marks and ambiguous conclusions. The straight line is giving way to the web. The arrival of the SMS has revolutionised the way we communicate with each other. Youngsters hardly ever use the telephone to actually phone anyone. They text. And although it looks as though their texts are still based on the good old alphabet, the link is starting to break down. CUL8R – is a whole new way of writing. Letters and numbers have become symbols for whole words rather than standing for a single sound. Our ‘alphabet’ is turning into logographs. Ask any eighteen year old what LOL, or ROFL means and they will have no hesitation in telling you. They no longer ‘spell it out’ because they are moving away from the linear alphabet. This is changing the way they think too, but that’s a whole other story for another time. Among the LOLs and ROFLs we also see little round faces with stylised expressions. These emojis pepper the logographs because we still need to communicate the more subtle elements of communication – things like our feelings. The range of emojis is growing at an astounding rate and they have gone way beyond little yellow faces. Each one is a small ideograph – a picture representing a concept. And the giph is yet another attempt to overcome the things that this new, infant script is lacking. Giphs are tiny, one-second videos that loop over and over. Frequently they show a face dynamically expressing a particular emotion. The eyebrows pop, the mouth sneers, the face breaks into an enthusiastic laugh. Now we can communicate the subtleties of body language without the use of an alphabet. That’s impossible to do with a logograph. In this digital age we increasingly think in complex, intersecting webs rather than in straight lines. Whether we will so adapt the linear alphabet with emojis and giphs that it becomes a new form of written communication remains to be seen. This generation’s brains are wired differently from ours. One thing we can be certain of is that they will mould the world to suit themselves, and that will include all the ways we communicate. I can’t wait to see what they come up with next. In our most recent book, “Thinking In A Digital World”, we explore the changes in our world as a result of digital media. The digital world is pervasive and here to stay. So is social media. It’s up to the grown-ups to understand it and help our kids navigate it safely and use it productively, creatively and enjoyably. Let’s look at safety first. Over two billion people actively use Facebook each month. If your privacy settings are set to “public”, you are giving them all access to your thoughts and images. Is this what you want for yourself? More importantly, is this what you want for your children? The internet has virtually unlimited memory. The photos you posted two years ago? They are still there. The photo you posted and then deleted? It’s still there too. Nothing disappears and clever people can find it all. Their motives are not always benign. Take a look at the blue band across the top of your Facebook page. You will see a tiny down arrow on the far right. Click on that and then select ‘settings’. This will take you to the General Settings page. On the left-hand side, there is a panel – select ‘privacy’ . Now you can decide just how widely you want your posts to circulate. My Facebook privacy is set to ‘friends’ for everything. I’m not interested in ‘friends of friends’ seeing my posts, because if I use that setting I may as well make everything ‘public’ and accessible to the entire two billion users. The moment I allow ‘friends of friends’ to see my posts, I have lost control. I don’t include my phone number when invited to by Facebook. If a friend wants my phone number I have the opportunity to send it to them via private message. I don’t want the world, or even all the people on my Facebook friends list, to have my phone number. I also have the opportunity on this page to check and change the audience for posts that in the past I may have set as accessible to public or friends of friends. That will limit any future access to those posts of mine, but it will have no impact at all on the people who have already seen them. I have set the visibility of my friends list to ‘friends’. I thought about setting it to ‘only me’ because that gives me the tightest control, but this is a social medium after all, and I don’t mind my friends knowing who I have as a friend. I don’t want to find myself showing up on a variety of search engines and so I have selected ‘no’ when asked if I want search engines other than Facebook to see me. As an adult, I have the right to make my Facebook life as open or as closed as I choose. I made a decision a long time ago to restrict my friends to people I had actually met face to face. This changed when I discovered a very small number of people on forums with whom I had been exchanging ideas over an extended period. I have allowed ‘friends of friends’ to send friend requests and sometimes I regretfully reject requests from people I have never met. These requests can arise because I have commented on a friend’s post and one of their friends is interested in my comment and would like to interact more with me. But I don’t want hundreds of friends on my personal Facebook page. I want the concept of ‘friend’ to bear some similarity in the digital world to its meaning in the physical world. On the other hand I know there may be a few exceptions. Finally, if you look again at the panel on the left you will see the ‘blocking’ link. Select that and see how you can remove people who are becoming tiresome, offensive or threatening. This is perhaps the control we need to point out more than any other to our children. I read with dismay the stories of people being bullied online. It’s hard to be bullied by someone if you no longer listen to them. If I find myself being insulted, abused or bullied online I have options. If I started the thread, I can delete it. If there is a particular person being objectionable, I can block them. As an adult, I can choose for myself how private I want to be. I like my privacy, but I also like to share thoughts and experiences with others. My privacy settings reflect that. Our children need to be kept safe until they are old enough and wise enough to judge people and their own safety. Until that time I advise setting privacy to ‘friends’ only, and to emphasize the ability to delete and block. TRUGS and what it means to “teach reading”? If I gave you a list of foreign words, taught you the generally applicable rules for decoding those words, then invented a game to let you practice this decoding, would you be able to read a novel written in that language? Would I have taught you how to read in that language? Or could you just ‘word call’ it – make every word sound just right but have no idea what the piece was about? In other words, is learning to pronounce single words correctly, without any syntactic or semantic, context really reading? Reading is about making meaning and without any syntactic or semantic cues individual words have wavering, shifting meanings, and sometimes no meaning at all. So why is it that a card game that helps children to decode individual words, devoid of meaning or context, called ‘Teaching Reading Using Games’ or TRUGS? Quite simply it is NOT a reading game. It’s a coding game. And reading is about far more than coding and decoding. The game is fine, and the ability to decode words through phonemic analysis and the application of grapho-phonic rules is an important skill, but let’s not pretend that playing the game is the same as teaching reading. Names are powerful. The change the way we think. So please, let’s not call this game TRUGS. It is a great decoding game. How about calling it Teaching Decoding Using Games instead? TDUGS?